Students are not familiar with the topics which are not in our national mandated curriculum. (American Civil War, Modern History of Europe etc). Concentrating on content does not efficiently help us to shape the students mind with historical thinking which is more important than the content itself. Many mainstream idea in history are not aligned with Islam. Starting with the relation between God, Man, Space and Time, freewill vs determinism, the creation of Adam vs primitiveness of early men, conflict between Muslim History and euro-centric timeline (classical, medieval and modern era), and many more. 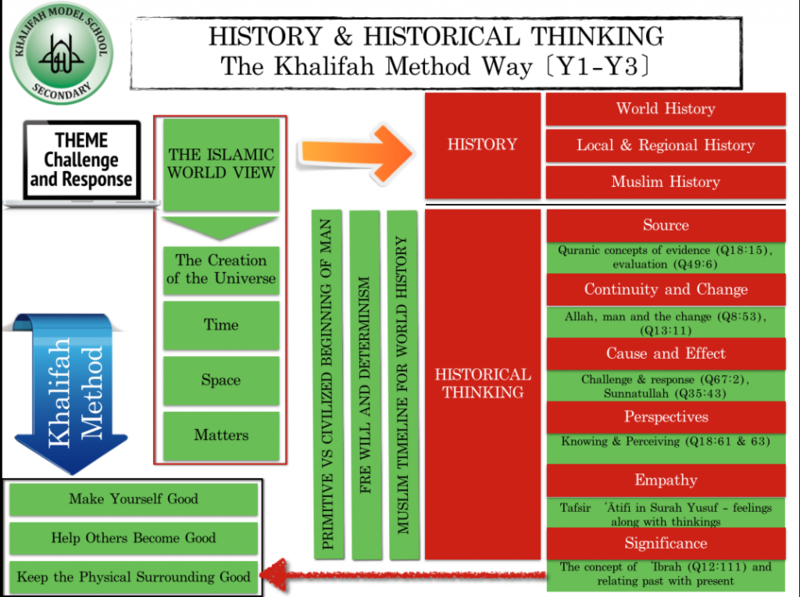 Therefore World History and Historical Thinking need to be reconstruct based on Islamic World View, and I choose the theme Challenge and Response (as described by Arnold Toynbee inspired by Ibn Khaldun), for the subject which is renamed as “HISTORY & HISTORICAL THINKING: The Khalifah Method Way [Y1-Y3]”. We want to concentrate on developing the historical thinking, while students are given the option to choose a wide range of topics in world, local and regional as well as Muslim history. They can choose which part of history they want to investigate, the subject will guide them with the ‘process of historical thinking’. So, they wont have to learn about American Civil War with no interest. They can choose to investigate the historical background of Minang Community in Negeri Sembilan if they are interested in it. The teacher’s role is to guide them with source, continuity and change, cause and effect, perspectives, empathy and significance. 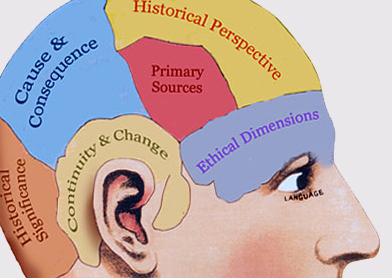 With a good possession of historical thinking, we believe that students will become lifelong learners of history. The structure and key themes for this module benefited the AC History Units developed by the History Teachers’ Association of Australia. Assalamualaikum Ustaz. Boleh cuba baca buku bertajuk “Building Learning Power”. Saya rasa ini sangat berguna untuk membentuk pemikiran murid2. Boleh saya cadangkan buku bertajuk Building Learning Power. Saya amat tertarik dgn kerja-kerja tuan. Mohon dapat keizinan Tuan untuk meluangkan masa untuk kita bertemu dan bertukar-tukar fikiran berkenaan Islamic Education dan mungkin juga kerja yang kita boleh buat bersama. Harap Tuan dapat berhubung dgn saya insyaAllah menerusi email di atas.